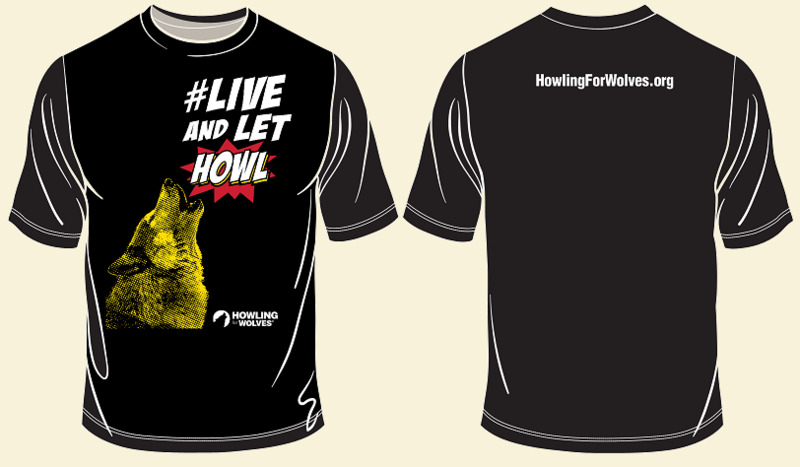 Please donate and wear our #LiveAndLetHowl t-shirt. The t-shirts are solid black made of organic cotton. See sizing information. This beautiful t-shirt is a conversation starter; often strangers will ask about the meaning of the t-shirt. This will give you an opportunity to tell them about wolf issues and the wolf hunt in Minnesota. Each t-shirt donation is $25. The donation (after costs) goes toward our 501c4 Howling For Wolves Action Fund which is not tax deductible and funds our work to change wolf state laws. The donation price includes shipping and handling. To order by mail, download the Order Form. ***Take a photo of you wearing your Wolf shirt, then share it with us on our social media by posting to FB, Twitter or Instagram with a hashtag #LiveAndLetHowl. Get others to do the same so everyone can spot the wolf advocates. International shipping is expensive. For example, the average cost to ship a shirt to England is $25. Please consider an additional donation if you are overseas.